Cut a slice off the top of the apple slightly deeper than the stem. Set slice aside. Cut the bottom of the apple, if necessary, to make sure that it will sit upright. Remove the core from the top of the apple without cutting all the way through to the bottom. Mix together lemon juice, honey and cinnamon and pour inside apple. Replace the slice of apple that was cut off the top. 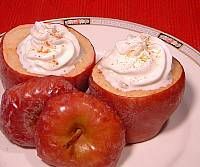 Fill warm apples with whipped topping.